Philanthropists come in all shapes and sizes, but for Martyn Myer there’s only one approach: roll up your sleeves and don’t take no for an answer. “It feels a bit wacky,” says Martyn Myer AO. 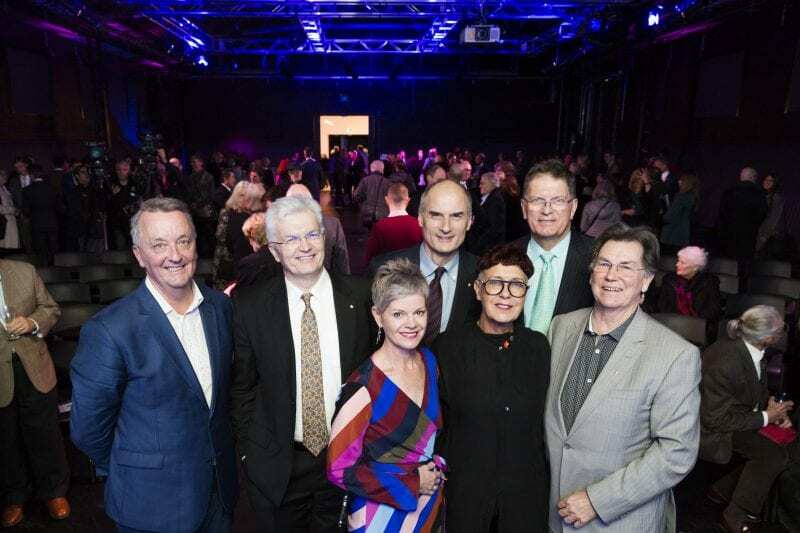 I’m sitting with the philanthropist, businessman and Deputy Chancellor of the Council of the University of Melbourne at The Stables, a new multimillion-dollar space on the Faculty of Fine Arts and Music’s Southbank campus. 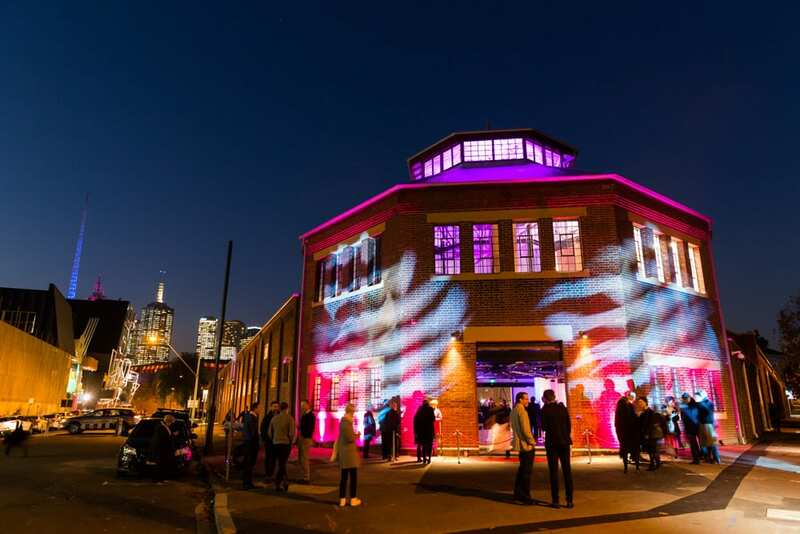 The heritage-listed former home of the Victoria Police Mounted Branch was re-opened this year as a stunning visual arts wing and multipurpose performance space that – wackily, from Myer’s perspective – has been christened the Martyn Myer Arena. L–R: Minister for Creative Industries Martin Foley MP, Vice-Chancellor Professor Glyn Davis, Faculty Executive Director Jane Richards, Deputy Chancellor Martyn Myer, N’arweet Carolyn Briggs, the Hon. Ted Baillieu, and Faculty Dean Professor Barry Conyngham at the launch of The Stables on 14 May 2018. That contribution came via Myer’s significant personal philanthropic support, in addition to that of the Myer Foundation, but also, crucially, in the business nous, grit and staying power he brought to the project. As he tells it, the University had been keen on securing the police stables as a teaching space for many years before getting the project off the ground – although getting inside for a proper look was less than straightforward. The launch of The Stables on 14 May 2018. By Drew Echberg. Moving on to the next pieces of puzzles seems standard fare for Myer, a trained engineer with degrees from Swinburne, Monash and MIT. He has a knack for bringing projects and people together, finding the bits that go best together and snapping them into place. The Ian Potter Southbank Centre will open for classes at Southbank early next year – a nine-storey, state-of-the-art home for the Melbourne Conservatorium of Music, realised through a combination of University, government and philanthropic funding, including from the Myer family, Myer Foundation and the Potter Foundation. Artist’s impression of The Ian Potter Southbank Centre, a new home for the Melbourne Conservatorium of Music. Courtesy of John Wardle Architects. Myer’s involvement with the University dates back to 1989. 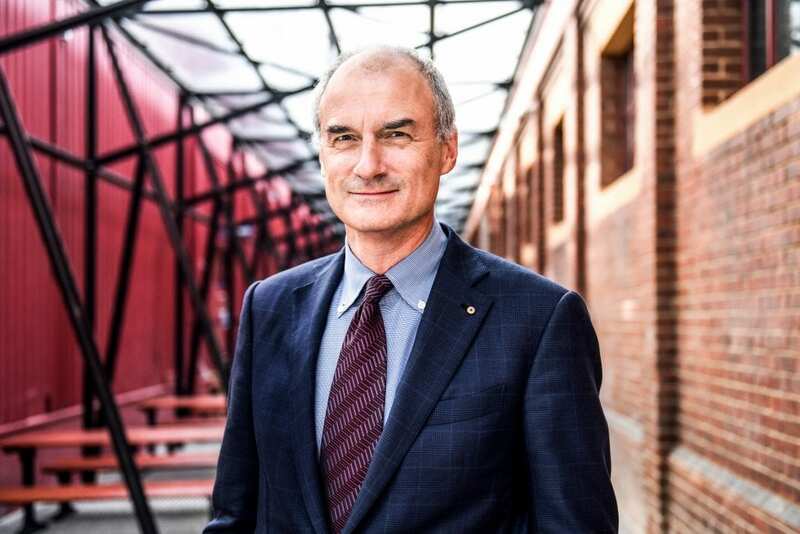 In 1992 he became a board member – and later President – of the Florey Institute, housed on the University of Melbourne’s Parkville campus in the Kenneth Myer building – named in recognition of the philanthropic support of Martyn’s father. He left the board of the Florey in 2009 and joined the University Council, but not before spearheading the revamped, multimillion-dollar Florey Neuroscience Institutes on Royal Parade and Heidelberg through a cocktail of philanthropic, state and federal government and University funding. The official opening of the new Parkville building in 2011 also marked the start of his involvement with the Faculty of Fine Arts and Music – thanks to the fortuitous attendance of Faculty Dean Professor Barry Conyngham. He’s not joking. Between 1965 and 1989, his father Kenneth Myer chaired the committee responsible for creating what would eventually become the Arts Centre Melbourne, a Southbank project he’d been heavily involved in since its inception in 1958; together with his siblings, his father brought another cherished landmark of the Arts Precinct into existence – the Sidney Myer Music Bowl – donating it to the people of Victoria and Australia in 1959, the same year in which the Myer Foundation was established. Sidney Myer – Martyn’s grandfather, himself a major philanthropist and founder of what was to become the Myer retail dynasty – was clearly not afraid to think big, and that trait continues to echo through the generations. 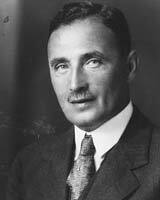 Businessman and philanthropist Sidney Myer. Wikimedia Commons. The Victorian Government’s investment in the revitalisation of Melbourne’s Arts Precinct is a case in point. The major public work now underway on landscaping, new arts facilities and upgrades to exisiting infrastructure has been described as a “once-in-a-generation” opportunity by state premier Daniel Andrews, a “game changer” that will “cement Melbourne as the cultural capital of Australia”. 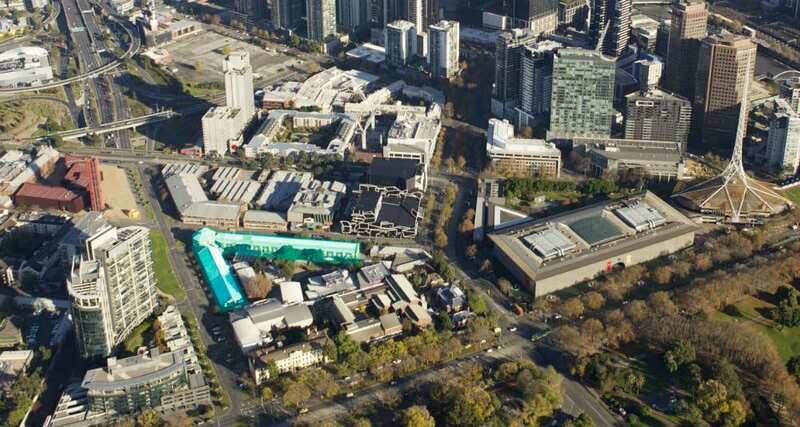 Aerial view of the Southbank campus, with The Stables highlighted. By Cloud 9 Photography. 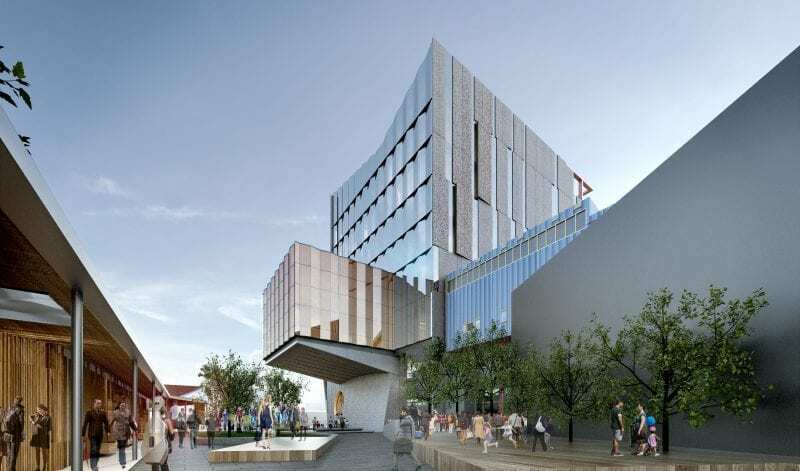 Being aware of those plans, and noting the obvious – that the Faculty of Fine Arts and Music campus was smack-bang in the middle of the proposed Arts Precinct redevelopment – was key. 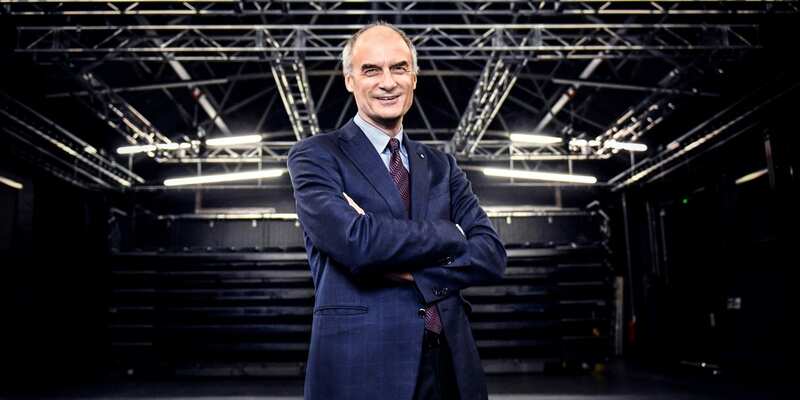 “Our philanthropic raise for the whole Southbank campus redevelopment was something like $40 million,” he says, “That’s actually a relatively modest amount of money, given we’ve so far achieved more than $200 million of project work. Working closely with the government is essential, not least in our case where securing the police stables was key to opening up the whole campus. 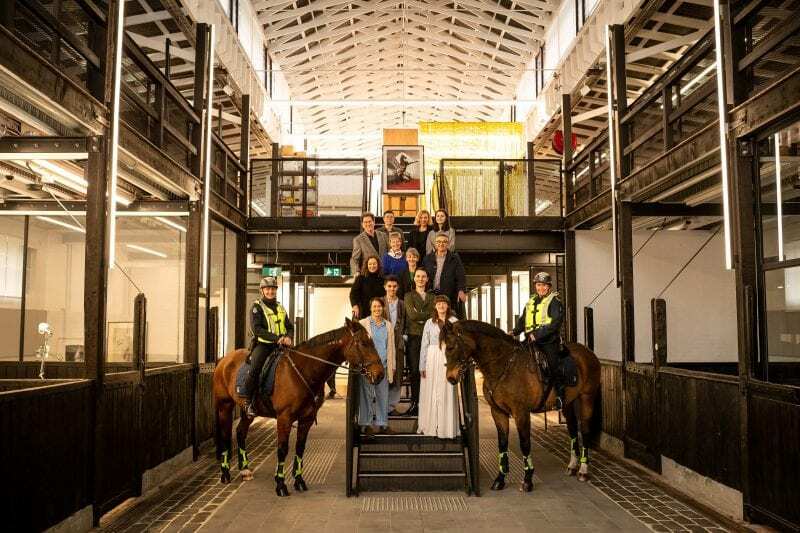 Victoria Police Mounted Branch members Monika Kusnierz (with Bob) and Christine Atherton (with Unity), flank Faculty of Fine Arts and Music students and staff, and architect Kerstin Thompson, in the refurbished Stables building. By Sav Schulman. I wonder if Myer ever felt a choice with philanthropy, whether it was there as a must-do given his background, and whether his own children – two daughters and a son – feel any pressure to follow suit. “We call philanthropy the glue that holds our family together,” he says. You know, business is business, and you’ve got to be hard-nosed, but philanthropy can be very inclusive, with lots of committees and activity involving many family members. In my generation, there are 13 of us, but there are already 45 in the next … and there might be more that a hundred in the generation after that. 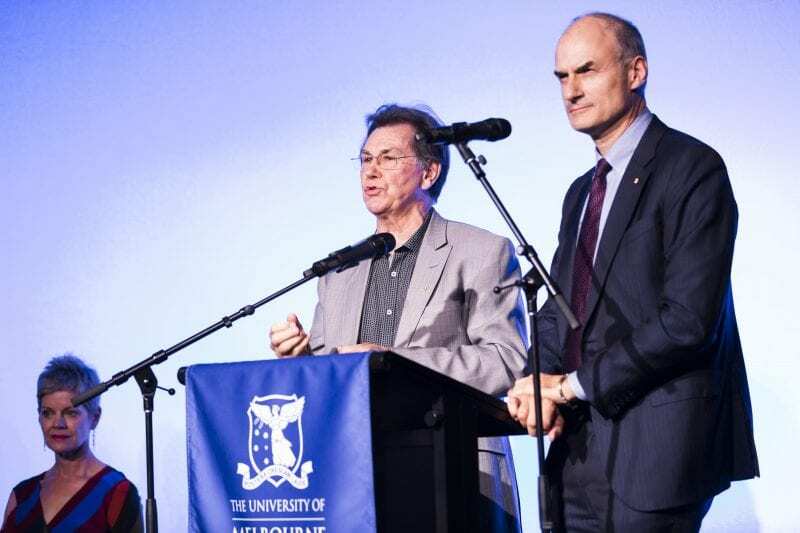 Professor Barry Conyngham, Dean of the Faculty of Fine Arts and Music, shares a lectern with Martyn Myer at the opening of The Stables on 14 May 2018. By Drew Echberg. As president of the not-for-profit Myer Foundation he has obvious insight into the value of a well-managed bequest, but sees his own philanthropy as a living, breathing entity that runs in tandem to the work of the Foundation. “In a project like the Southbank campus redevelopment, you’ve got to lead by example,” he says. “I can’t ask the family’s foundation for money unless I’ve put some serious funds on the table. I also have the view that I should give while I’m alive because I want to get my hands dirty and help steer things in the direction I think they should go. He holds true, he says, to the maxim of self-made billionaire Warren Buffett – that the perfect inheritance for his children is “enough money so that they would feel they could do anything, but not so much that they could do nothing”. 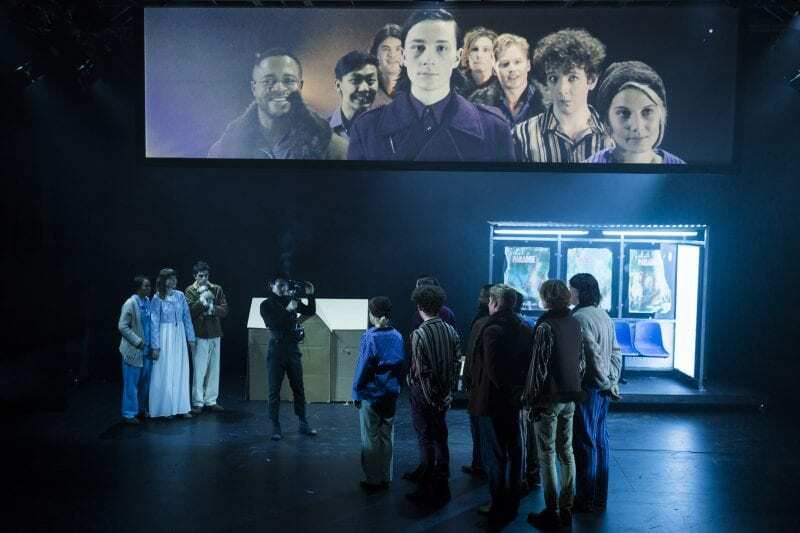 VCA Theatre and Production students staged a contemporary retelling of Peter Pan as the first performance in the Martyn Myer Arena, in June 2018. In addition to the Southbank campus redevelopment, he’s working with the University on a major new development in the Parkville biomedical precinct focused on innovation and commercialisation and the new University of Melbourne campus in Fishermans Bend focused on heavy research and engagement with industry. And then there’s Cogstate Ltd, the listed commercial company he has built over two decades and which is now a market leader in cognitive testing software for pharmaceutical drug development. How does that work? “Well, if someone’s developing a new drug, they need to know if that drug’s safe, first and foremost, and secondly whether it does what it’s meant to,” he says. “And the software tools we provide are based on research done right here at the University of Melbourne. I couldn’t help noticing, in doing research for this interview, that Myer and his wife Louise also own a “small exclusive boutique hotel on Lake Wanaka in the Southern Alps of New Zealand”. Featuring “just six suites and deluxe rooms” it seems a suspiciously low-key venture, in relative terms, for the couple to be involved in. He’s also a longstanding member of a recreational road-cycling team, the Martinis – “Our motto is often stirred, never shaken” – although in recent times he says he’s fallen from the A-team. Martyn Myer outside the Martyn Myer Arena. By Giulia McGauran. I get the impression retirement isn’t imminent, or even desirable, for Myer. He shrugs off the suggestion. “I’ve learned from my involvement with neuroscience that the key is to keep your brain active,” he says. “My uncle Bails is 93, still active intellectually. He’s very engaged with what’s going on in the world. There’s no cure for Alzheimer’s, but there are plenty of things you can do to improve your odds. We stare at each other, try to think of a funny versions of the Martyn Myer Arena, fail. Around the official opening of The Ian Potter Southbank Centre next year, he plans to hold a big party in the Arena – and to choose his guests wisely. Banner image: Martyn Myer inside the Martyn Myer Arena. By Giulia McGauran. Visit the Southbank Campus Redevelopment website. To find out how you can support the Faculty of Fine Arts and Music please contact Mr Peter Barron or visit our website. See also: Welcome to The Stables – a new, world-class arts facility in Melbourne’s Arts Precinct.